The Singapore-KL connection topped OAG's busiest international routes rankings with 30,537 flights. 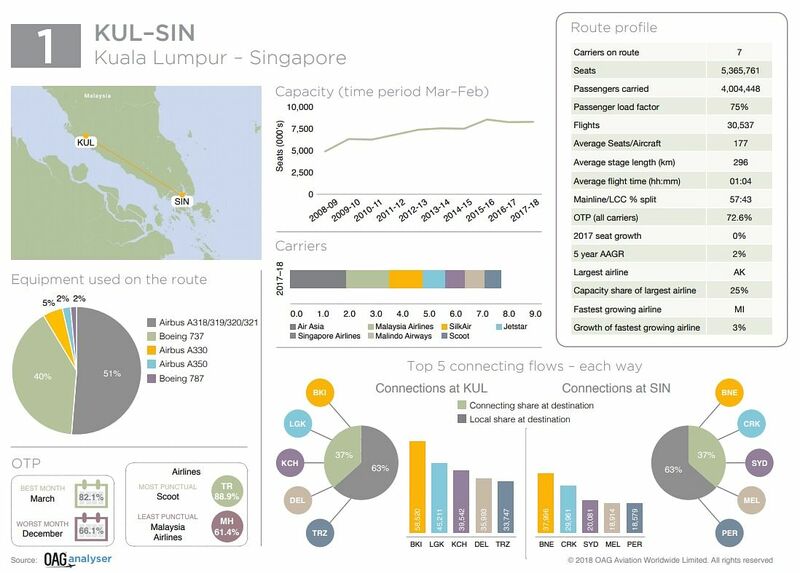 SINGAPORE - The Singapore-Kuala Lumpur route is the world's busiest international air link, pushing Hong-Kong Taipei into second place and Singapore-Jakarta into third. The ranking by industry consultancy OAG is based on the number of flights between two cities in the 12 months to the end of February 2018. 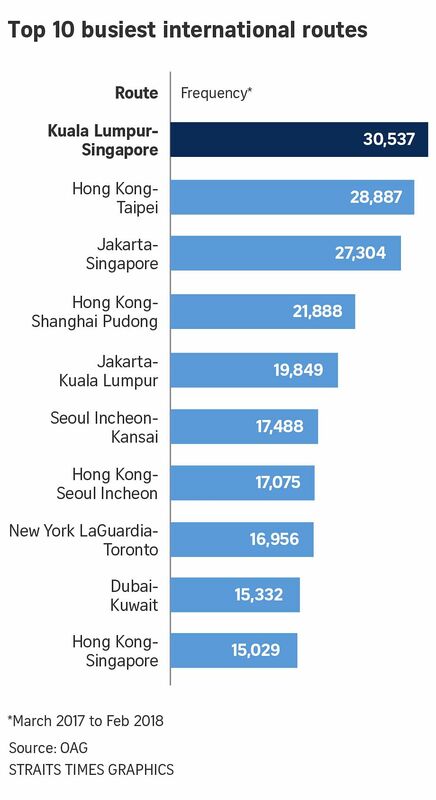 The Singapore-KL connection topped OAG's busiest international routes rankings with 30,537 flights, compared with 28,887 flights for Hong Kong-Taipei and 23,704 flights for Singapore-Jakarta. Mr Mayur Patel, OAG's regional sales director for Japan and the Asia-Pacific, noted that 14 of the world's busiest 20 routes, including eight of the top 10 routes, are between Asian cities. "Given the robust expansion of air passenger travel across the Asia-Pacific and the fierce competition between carriers in the region, it is unsurprising," he said in a press release on Thursday (May 3). Turning to airports, OAG noted that Hong Kong was the busiest Asian airport hub, featuring in six of the top 20 routes while Changi Airport featured in four. Mr Patel said: "While this intense level of competition offers impressive flight frequencies and competitive prices for consumers, it adds pressure to the operating costs and on-time performance of carriers, and may prove unsustainable over time." Other industry experts noted that the expansion of low-cost carriers in Asia has significantly boosted the number of air services between Asian cities, including Singapore-Kuala Lumpur and Singapore-Jakarta. Mr Brendan Sobie from the Centre for Aviation noted in a re cent report that low-cost carriers in Singapore now operate a fleet of 60 aircraft - 44 from the Airbus 320 family and 16 Boeing 787s. In 2012, they had just 37 planes in total. Low-cost carriers currently account for about a third of total passenger traffic at Changi Airport. There are now 18 such airlines offering both short and long-haul flights to and from Singapore, added Mr Sobie.